Tim, the bear, has caused quite the 'uproar' in Russia. Many have spoken up strongly following this incident. 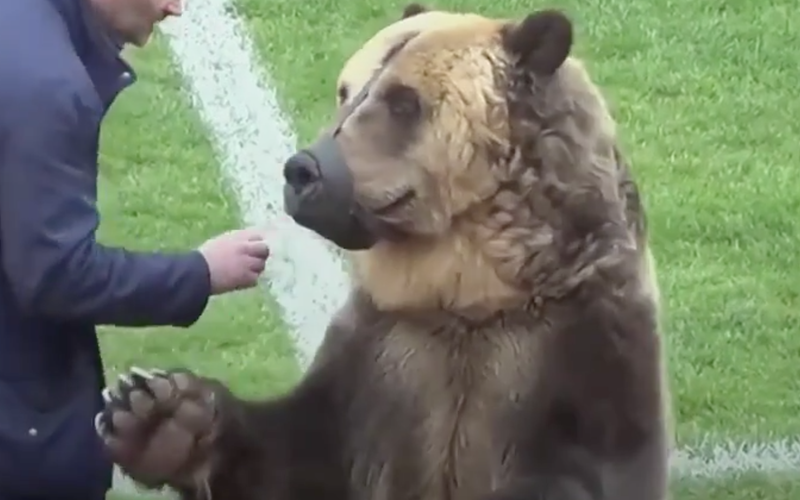 Footage of a bear performing in front of fans before a huge league match has been condemned by many. BBC has reported that the incident took place in Pyatigorsk, Russia during a football match. 'Tim' the bear can be seen handing the ball to a referee, and then proceeds to entertain the crowd by sitting down and clapping repeatedly. There have been reports that FIFA want to use Tim as part of the opening ceremony of the upcoming World Cup, which takes place in June, but they have denied this. Read: Man teases bear with food, gets mauled and survives! Animal rights groups have strongly spoken up and condemned the use of the bear, calling it 'inhumane'. Many on social media were furious after seeing the video footage. "This is absolutely disgusting. Why does mankind continually think all other animals are here for its pleasure /abuse/entertainment," said Mark Pickman. However, on the other hand, others are saying that people need to lighten up because Tim is providing entertainment, and was not being abused. Read: Teenager escapes from bear's jaws! "I am against any cruelty but this bear doesn't look under fed I don't know there is so much cruelty around which makes me more angry (sic)," said Ann Roach. For me personally, I do think that it was cruel to allow a bear to do this. Bears are wild animals, and should not be handling balls on a field, but rather be in an environment conducive to them. They should be in the wild, and not on the field. Are you with me on this one, or am I overreacting?